5.0 out of 5 starsThis is Ms. Farnham’s best work to date! Spin is told in multiple POV’s, but each chapter is clearly defined as to which character is talking. I couldn’t put this book down! She had from hooked from the first page to the last word written. Jenna Kemp appears to be a normal high school teenager, but in reality she is hiding a secret from her family and friends. This secret starts to consume her and her once normal life starts spinning all around her. It starts as a slow spin, but is soon spiraling out of control, and she needs to find a way to make it all stop. Just when Jenna finally starts the process of getting her life back on track, she goes missing. After a few nights of her not returning home, her family and her friends realize that Jenna was in more trouble than they thought. Everyone is trying to figure where she went, with whom and why….including myself. I was literally on the edge of my seat trying to play detective. EVERY time I thought I would know those answers, Ms. Farnharm would flip something around or give me a little more information, and I would have to start all over again! Can her friends and family find her? Will Jenna finally expose her secret or will her life just keep spinning downward. One of my favorite lines from this book is “When they were kids, going as fast as possible was the ultimate goal. But now that they were older, going slow seemed like the right thing to do”. I'm going to start out by saying every teen and every adult who has contact with teens (so pretty much every single person) should read this book. It's a great way to open up the lines of communication with a teen about pretty much any subject, including the really hard ones. K.J. does a fantastic job of making this story come alive and makes you feel like you know Jenna or like you could be Jenna. Every character in this story jumps off the pages and becomes real in your mind because she has created such realistic characters from Jenna to Hayley and every one in between. This book will make you feel so much before it even comes to its conclusion and boy what a conclusion it is! I'm pretty sure most people will be smiling through their tears and will be completely satisfied with this ending, even if it's not what you were hoping for. 5.0 out of 5 starsAnother great job! Such a huge fan! I have loved every book. They may not be the easiest subjects but they such important ones! I am most definitely a fan for life! GREAT job!!! ❤❤❤ Do yourself a favorite and read ALL her books! Spin for the win!! Thank you, K.J. Farnham, for chosing topics that need to be discussed, need to be brought to attention, need to be seen. Even though I've got a headache from crying, a heartache from hoping against hope, I really enjoyed the book. 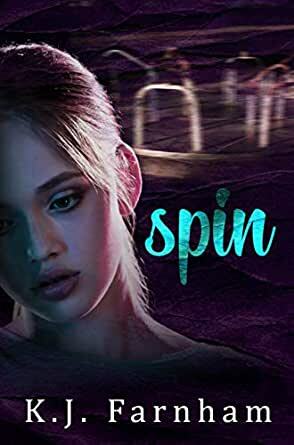 Spin by K.J. Farnham is a story about the subject that no one wants to talk about, sexual abuse. Jenna is a normal teenager so it seems to her family and friends until her life starts to spin out of control. This story is told by multiple points of view, and it goes from before Jenna's disappearance to after Jenna's disappearance. It was a hard book to read in some parts of it but it was also an eye-opener as well. This is my first time reading this author and I enjoyed her work very much, this particular book grabbed me from the very first chapter to the very last chapter, I was hooked. Me. Farnham is now on my favorite author's list.